Something off topic. I’m also a member of the Schachfreunde Sasbach chess club for ages and now we even have a world chess champion! The following text is mainly an english translation from http://www.schachbezirk-mittelbaden.de/wp/?p=12682. The pictures i took out of our newspaper (forgive the bad quality). Congratulations to Raphael Zimmer! He won the tournament of the World Youth Championship of the disabled at Orlando, Florida, and thus the title of a world champion. The tournament took place from 22nd to 29th June 2017. Raphael won all 7 games of the tournament. A sovereign victory. Raphael is well known in the chess scene, so he joined the Schachfreunde Sasbach at the age of five and was already able to collect several successes with both the team and the individual. In addition to several titles at state level are worth mentioning the first place at the German U16 championship 2015 as well as the first place at the German U20 championship 2016 with the team of SF Sasbach. 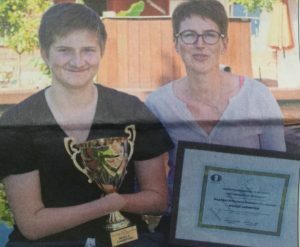 Also in 2016 Raphael won the German schoolchildren championship with the team of the Lender Gymnasium Sasbach. 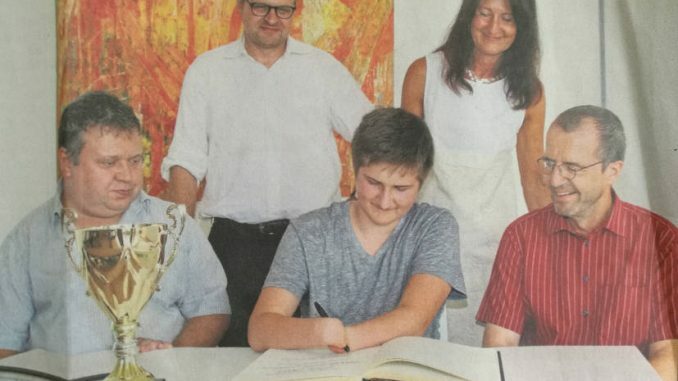 He became second in the German U14 Championship in 2016 and fifth in the German U14 Championship in 2017. Raphael gained international experience in the Disabled World Cup for adults 2013, 2015 in Dresden and 2016 in the European Championship U14 in Prague. Nevertheless, the trip to the USA was something special for the thirteen year old. Raphael was accompanied by his parents, his coach Nikolaus Sentef prepared him from home via the Internet to his opponents. Also in Orlando as the representative of the German chess federation was Grandmaster Thomas Luther, who supported Raphael for years. Luther, chairman of the Commission for disabled players at the FIDE World League, played a key role in the development of the first World Junior Championship for disabled people. Raphael was also supported by “Bundesnachwuchstrainer Bernd Vökler”. He had chosen Raphael as the representative of the German chess team for the World Cup, and he was there to help the family room with advice and action. After Florida came eight players who competed for the coveted trophy of the world champion. The championship was played as a round tournament, each player compete against every competitor. Raphael was first settled. This is, of course, good, on the other hand all are particularly hard because they want to defeat the best. In round 1 Raphael met the black stones on Samarth Jagadish Rao from India. Although Rao had a small ELO number, Raphael already noticed after a few moves that he is sitting opposite to someone who knows how to play chess (well). Favorite back and forth, nothing will be given to you. Rao played solid but somewhat passive, so Raphael took the initiative in the early middle game and won after a brief but violent attack on the 25th move. After the successful opening match the tournament went well. Raphael defeated one opponent after another. In the penultimate game he came against the nominally strongest opponent and direct pursuer for the world championship title, the 19-year-old Natasha Morales from Puerto Rico. Natasha, her signature WIM (International Female Champion), had four out of five points, one point less than Raphael. With a victory both Samart Jagadish Rao and Samarth could have caught up with the leaders. Raphael had once again the black stones, Natasha closed. It looked like a tough, long struggle, but on the sixteenth move Raphael was able to hold a strong pleasant center. Following the principle of the two weaknesses, Raphael now pushed forward with a pawn on the king’s wing, set a trap for his opponent and won it! Raphael Zimmer is a round before the tournament the first junior chess world champion of the disabled. In the last round, Raphael was compelled to win against Wasswa Sharif Mbaziira from Uganda and ended the tournament with sensational seven points from seven games before the Indian Rao, who came to six points. Congratulations to Raphael, St. Raphaels just happens to be the name of the Hospice that my Mum is critically ill in.